​W hen I was a small child, I liked butterflies, but considered moths drab and boring. Then I saw a giant silk moth and learned some of our native moths are as spectacular as any butterfly. Michigan has four giant silk moth species with wingspans up to six inches across. 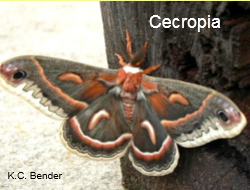 These moths also have stunning color patterns and classical names like cecropia, luna, promethea and polyphemus to match their physical beauty. The “silk” part of their family name comes from the fine thread that their caterpillars produce to spin the cocoons where they transform into moths. While our North American species have never been used to manufacture silk, the thread from some of their Asian cousins has been used for this purpose for thousands of years. I saw a few cecropia moths growing up in Lansing, and now occasionally see all four of Michigan’s giant silk moths here in rural Calhoun County. I am including descriptions and photographs of each of these species to help our readers identify any that they see this summer. The caterpillars also become quite noticeable in late summer, and those photographs show the final growth stage where some can reach four inches in length. red and white crescents and borders on its wings. The caterpillars are as fierce looking as the moths are beautiful, and have numerous yellow, blue, and orange-red knobs full of spines on their light green bodies. 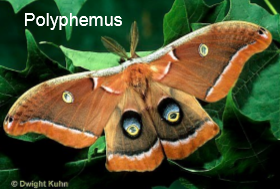 The polyphemus moth is almost as large as the cecropia, and has very conspicuous yellow, blue, and black eyespots on each of its tan-colored hind wings. The caterpillars are bright green, and have a vertical yellow line on each side of each body segment. 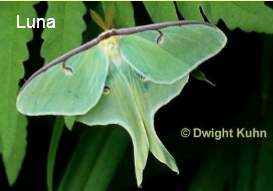 The luna moth is lime green with a long swallowtail on each hind wing, and widely regarded as the most beautiful of all North American moths. Young children are apt to recognize this moth from illustrated stories in some popular children’s books. Luna caterpillars are recognized by the pale yellow line running along each side of their light green body and numerous small bristles on their backs. males are darker than the females, and both sexes become active in the afternoon rather than at dusk like the preceding three species. Their caterpillars have four prominent orange-red spikes behind their head, a single yellow spike near their rear, and numerous small blue or black spots on their pale green body. The internet contains a large amount of information on these four moths, and most of it states that they emerge from their cocoons in June. While this is frequently true, I have also found them fluttering around my house lights later in the summer. On the other hand, I always find their mature caterpillars in late summer when the moth literature says that people are apt to notice them. While some of these caterpillars have dangerous looking spines, I have never suffered any ill-effects from handling them. However, a few of our smaller native silk moth caterpillars like the Io and buck moth ones can give painful stings. As a result, parents should know the species or handle the caterpillar themselves before allowing young children to touch any large, bristly caterpillar. ​Silk moth caterpillars spin the cocoons where they will transform into moths during this late summer period. This makes it possible to keep a caterpillar in a cool, well-ventilated cage until it spins its cocoon, and then find a beautiful moth there sometime during the following spring or summer. Caterpillars do require fresh leaves to munch on until they spin a cocoon, and the internet contains information on each species’ food preferences. Luna caterpillars also like some dry leaves to snuggle their cocoon down into for winter insulation. It is important to remove any little white eggs that parasitic wasps have deposited on the caterpillar’s back before it spins a cocoon around itself. If the caterpillar passes into the cocoon stage with these eggs in place, tiny larvae will hatch and burrow into the caterpillar and consume it alive. It is also important to keep the cage in a sheltered outside location through the winter so that the moth develops naturally and emerges from its cocoon when potential wild mates are present. 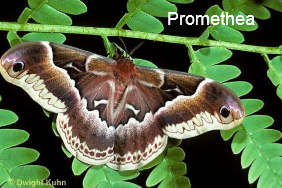 The caterpillars that survive these challenges will emerge from their cocoons as giant silk moths and become active around dusk (or earlier for promethea moths). Female moths emerge full of eggs, and release plumes of strong chemical scents called pheromones to attract male moths to fertilize them. The males fly around searching for these trails, and are reputed to be able to follow them to females more than a mile away. This remarkable ability to find each other is critical because giant silk moths only live a few days. This short life span also makes it important to release caged moths as soon as they dry their wings and show an interest in flying. Some Michigan nature centers conduct giant silk moth programs that provide opportunities to purchase caterpillars for a nominal price. These efforts are particularly important because our giant moths are being hurt by chemical spraying and an invasive fly that injects its parasitic larvae directly into the caterpillar’s body. Sadly, this tachinid fly was imported from Europe to help control forest and agricultural pests without considering how it would also hurt our desirable native moths and butterflies. However, Michigan still has modest populations of giant silk moths, and they are attracted to house and yard lights just like their little moth cousins. Hopefully, several of us will find one fluttering around our porch light or clinging to our screen door some night this summer.